Pedro da Costa on Krugman's Answer to My Question "Should the Fed Promise to Do the Wrong Thing in the Future to Have the Right Effect Now?" 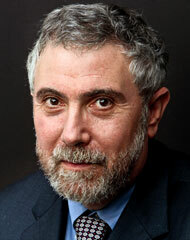 Paul Krugman: believer in Wallace neutrality? On the question of how the world works, “Wallace Neutrality and Ricardian Neutrality” links to Scott Sumner’s answer, while “Trillions and Trillions: Getting Used to Balance Sheet Monetary Policy,” links to Noah Smith’s answer. Scott, Noah and I are on record against the frictionless model behind Paul Krugman’s views. I have tried hard to convince Brad DeLong on this issues, as you can see in “Miles Kimball and Brad DeLong Discuss Wallace Neutrality and Principles of Macroeconomics Textbooks.” My sense is that Brad has come around to some degree, though that may be just wishful thinking on my part. Let me be clear that this scientific issue will become most important when the economy has recovered. At that some, I forecast that some voices will call on the Fed to “keep its commitment” to leave interest rates low even after the economy has recovered “in order to maintain credibility for stimulative promises in the more distant future.” The Fed needs to be able to point back to a clear record of statements showing that it never made such a commitment. Those most concerned about inflation (“inflation hawks”) in the FOMC (the Federal Open Market Committee, which is the monetary policy decision-making body in the Federal Reserve System) should be particularly worried about this, and should make clear in every speech that the Fed has not made any precommitment to overstimulate the economy in the future. If large scale asset purchases have an independent effect on the economy (not working through expectations), building up a track record of following through on promises to overstimulate the economy is unnecessary. In other words, if the real-world economy does not obey Wallace neutrality, situations in which the federal funds rate and the Treasury bill rate are close to zero can be dealt with by purchasing other assets, instead of by promises of future overstimulation. My recommendation is that the Fed continue to insist that it is only predicting its future policy, not precommitting. Even better would be to make clear that the Fed will continue very vigorous stimulative policy until output is again fully on track to reach its natural level, but is making no commitment to push the economy above its natural level of output (unless doing so is necessary for price stability). If I understand correctly, recommendations by Market Monetarists that the Fed should announce that it is targeting nominal GDP are in this spirit.